So perhaps it is the Cincinnati baseball franchise of which we should respectfully ask: “Who dey?” During the team’s bumpy early history, its official name bounced between Reds and Red Stockings as it brawled its way through various leagues. Throughout this period the hyphenated nickname Red-legs can be found in abundance. Whether the team’s name officially became Redlegs in 1953 depends on your definition of “officially.” A new team logo did suddenly appear, introducing our beloved mustachioed character—albeit with the name “Red Stockings” on his jersey, so as to equally annoy everyone. The Doctor can find no official name-change announcement or press release. 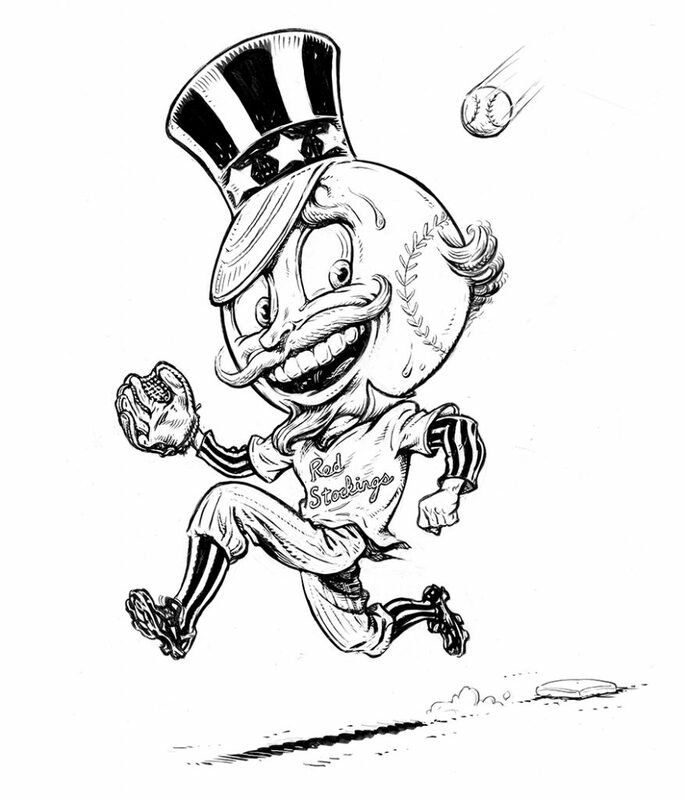 The team’s ads and merchandise said only Redlegs, but sports headlines and columnists used both names interchangeably. The franchise’s return in 1960 to just Reds was similarly unannounced but understood. Both names, however, stayed in use for years. Therefore, the Doctor is unable to provide a firm resolution to your argument. Footnote: When our team faced the New York Yankees in the 1961 World Series, concern was voiced that the country might be forced to see the painful headline, Reds defeat Yanks. The Reds lost, so America won. When viewing the Servatii logo, the eye is drawn to the large S on the left, standing in its keystone thingy, atop a background of fat-Sharpie-ish squiggly swoopies. The Doctor apologizes for using sophisticated graphic design jargon, but such detail may explain why you failed to notice the far end of the logo and its lower-case letters. The original 1940s Café Servatii was in Muenster, Germany, named after its popular location, Servatii Platz. The proprietor’s son, Wilhlem Gottenbusch, kept the name when he opened Cincinnati’s first Servatii Pastry Shop in 1963. You can still call the same phone number, but you’ll have to look up numbers for Servatii’s other locations. The logo, like the business, comes from family: hand-drawn by Wilhelm’s wife, Marie. Greg Gottenbusch, who now runs Servatii with his brother Gary, can offer no reason why his grandmother decided to change the lettering to lower case in the home stretch of the word. Since today’s corporate logos mix upper and lower cases as if someone’s finger were twitching on the caps lock button, you could call her quite visionary. The previous Doctor addressed this issue in September 2013, offering Be Sure My Wife’s Volkswagen Reaches Every Possible Country as an example. As for “authorized,” you clearly have no appreciation for the awesome responsibilities that fall on the shoulders of our city officials. How can they possibly find time for such trivialities as this, when they are faced with finding new streetcars that can operate three out of four seasons per year? The next soccer stadium location that makes entire neighborhoods bring out the pitchforks? A method for remembering the sequence of our downtown streets (Broadway, Sycamore, Main, Walnut, Vine, Race, Elm, Plum, Central) has generated several solutions. The most popular, having been actually taught in some local schools, is Big Strong Men Will Very Rarely Eat Pork Chops. Some replace Pork Chops with Potato Chips, as if that were somehow healthier. Isn’t it typical, some sneer, that this discriminates against all who approach downtown from the west side? For them, there is Cute Pink Elephants Run Very Well, South-Bound. It has also been suggested—ahem—that we all could simply memorize the term Google Maps.